Turn it up to 11 with Spinal Tap. 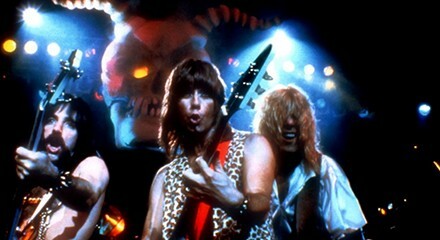 Music writers Greg Kot and Jim DeRogatis, hosts of the radio program Sound Opinions, continue their movie series in Millennium Park tonight with the ultimate fake rockumentary, This Is Spinal Tap. Don’t think that hearing "Big Bottom" blast over a state-of-the-art sound system isn't going to sound absolutely spectacular. Also, D-minor remains the saddest of all keys. For an entertaining look into the life of swingers, check out Bruce Norris's The Qualms at Steppenwolf tonight. Tony Adler writes, "It's pretty delicious—and not in Norris's typically cruel way. With The Qualms he begins to look like the most Wildean satirist maybe since Wilde." Californian indie-poppers Crocodiles stop by the Empty Bottle tonight. Miles Raymer calls their fuzzy beach music a "harsher toke than their contemporaries, with a more nocturnal attitude and a hint of danger."